Have shootings influenced gun legislation? 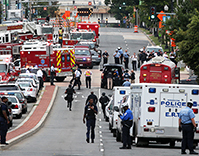 Congress remains stalemated on gun-related legislation, despite a shooting in September at a federal military facility, in which a dozen people were killed about a mile from the U.S. Capitol, as well as 2014 mass shootings in Santa Barbara, Calif., and Fort Hood, Texas. After Congress failed to strengthen federal background checks following the 2012 Newtown, Conn., school massacre, movement shifted to state lawmakers, who enacted about twice as many laws loosening gun regulations as tightening them. Although the Senate approved a head for the Bureau of Alcohol, Tobacco, Firearms and Explosives, a surgeon general nominee remained in limbo because of gun issues. Meanwhile, former New York Mayor Michael Bloomberg outlined plans to create an advocacy group to counter the National Rifle Association. Polls show that public support for gun control, which spiked after Newtown, has diminished, with public opinion divided evenly between supporters of gun control and gun rights. Congress took little action related to gun legislation over the past year, despite earlier momentum that arose after Adam Lanza killed 26 students and adults in Newtown, Conn.